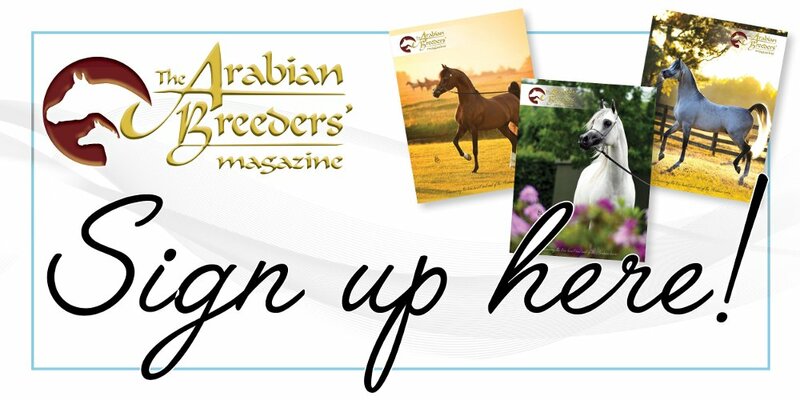 The Arabian Breeders’ Magazine continues to shine, standing out among the many Arabian breed publications that exist today. With its breeder focus, in-depth interviews with breeders and trainers, detailed features on Arabians past and present, as well as educational and health features, the publication is truly a coffee-table book with substance as well as weight. Around the world, breeders and owners turn to The Arabian Breeders’ Magazine to share their own story, of their farm and their horses. This is a publication dedicated to learning, to sharing knowledge, and to returning to the true heart and soul of the Arabian horse – one that showcases the passion, the history, the stories. The forthcoming edition will be available at the Paris World Championships, the pinnacle of the worldwide show season. As ever, The Arabian Breeders’ Magazine offers something for every breeder, and every budget. With the most competitive advertising rates in the world, can you afford not to be part of this edition? The deadline is 20 October, and you can book your space – be it advertising or editorial – by e-mailing info@thearabianmagazine.com or calling +44 (0)1508 536099 during UK office hours. We look forward to sharing your horses with fellow breeders around the world.